Mesopotamia is one of the cradles of human civilization. Here, the earliest cities in world history appeared, about 3500 BCE. c. 5000-3500 BCE: The first city-states gradually develop in southern Mesopotamia. This is the achievement of the Sumerian people. c. 3500: Writing begins to be developed. At first this is based on pictograms, and takes about a thousand years to evolve into a full cuneiform script. c. 2300: King Sargon of Akkad starts conquering the first empire in world history. The empire reaches its height in c. 2220.
c. 2100: The city of Ur becomes the centre of a powerful Mesopotamian state. It soon falls into decline. This marks the decline of the Sumerians as the Amorites, a nomadic people, start moving into Mesopotamia. 1792-49: King Hammurabi of Babylon conquers a large empire. Hammurabi is famous for the law code which he issues. His empire begins to decline immediately after his death. c. 1530: Babylonia is conquered by the Kassites, who rule the area for 400+ years. From 1100: Nomadic peoples such as the Aramaeans and the Chaldeans overrun much of Mesopotamia. The kingdoms of Babylon and Assyria go into temporary decline. Please see the article on Assyrian civilization for later developments within Mesopotamia. 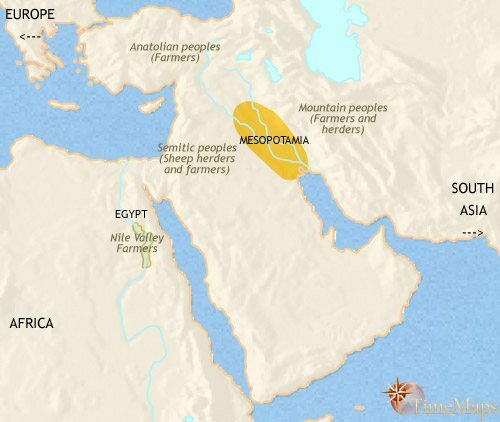 “Mesopotamia” is a Greek word meaning, “Land between the Rivers”. The region is a vast, dry plain through which two great rivers, the Euphrates and Tigris, flow. These rivers rise in mountain ranges to the north before flowing through Mesopotamia to the sea. As they approach the sea, the land becomes marshy, with lagoons, mud flats, and reed banks. Today, the rivers unite before they empty into the Persian Gulf, but in ancient times the sea came much further inland, and they flowed into it as two separate streams. The land has too little rainfall to grow many crops on. As a result, much of it has been – and is still – home to herders of sheep and goat. These nomads move from the river pastures in the summer to the desert fringes in the winter, which get some rain at this time of year. At various times they have had a large impact on Mesopotamian history. Near the rivers themselves, the soil is extremely fertile. It is made up of rich mud brought down by the rivers from the mountains, and deposited over a wide area during the spring floods. When watered by means of irrigation channels, it makes some of the best farmland in the world. The marshy land near the sea also makes very productive farmland, once it had been drained. Here, the diet is enriched by the plentiful supply of fish to had from the lagoons and ponds. It is this geography which gave rise to the earliest civilization in world history. Agriculture is only possible in the dry climate of Mesopotamia by means of irrigation. With irrigation, however, farming is very productive indeed. A dense population grew up here along the Tigris and Euphrates and their branches in the centuries after 5000 BC. By 3500 BC, cities had appeared. The surplus food grown in this fertile landscape enabled the farming societies to feed a class of people who did not need to devote their lives to agriculture. These were the craftsmen, priests, scribes, administrators, rulers and soldiers who made civilization possible. At the time when civilization first arose in Mesopotamia, the population was divided into two distinct groups: those who spoke Sumerian (a language unrelated to any modern language), and those who spoke Semitic dialects (related to modern Arabic and Hebrew). It was the Sumerian-speakers who lived near the great rivers, and it was they who built the first cities. Their language therefore became the first to be written down in world history. The first script to be used was based on pictures, and is therefore known as “pictographic”. They first appeared around 3500 BCE. By 3000 BCE the pictograms (of which there were more than a thousand) had become highly stylized, and were losing their original meanings. They were gradually becoming more “phonetic” – that is, reflecting spoken words. Finally, around 2500 BCE, the script had evolved into “cuneiform” – or wedge-shaped – writing. This was written by means of triangular-tipped stylus tools being pressed onto wet clay, and the symbols (which had been reduced to a more manageable 600 or so) were highly stylized and abstract. Learning to write in cuneiform was a long and rigorous process, and literacy was confined to a small elite of priests and officials. Cuneiform was at first written in the Sumerian language. For more than a millennium Sumerian retained importance as the language of administration, religion and high culture. However, in the centuries after 2000 BCE, it increasingly fell out of everyday use. In its place, a Semitic dialect, Akkadian (also known as “Old Babylonian”) became widespread. Later still, in the early 1st millennium BCE, another Semitic dialect, Amaraic, took its place. The waxing and waning of these languages reflected population movements within Mesopotamia, and to the rise and fall of ruling kingoms and empires with which they were linked. As each language fell into decline in everyday use, it retained its useage amongst the conservative temple priests – much like Latin was used in the monasteries of Medieval Europe long after the rest of society had moved on. The cuneiform script, first developed by the Sumerians, remained in use, adapted for each successive language. One of the most remarkable things about Mesopotamian civilization is that here, right at the dawn of recorded history, we find states which organized their populations more tightly than all but a very few in subsequent ages. In truth, this situation is the result of gradual steps taken over hundreds, even thousands, of years, and only appears to arrive fully formed as written records begin to shed their light; however, the sheer scope of the state’s control over the lives of the people is astonishing. Politically, the each Sumerian city formed its own city-state, composed of the city itself and the farmland for several miles around. These city-states were fiercely independent from one another, and warfare between them was frequent. In early Sumerian cities, the temple stood at the very centre of public life, both political and religious. The god of the city was held to own the city; in practice, this translated into the temple controlling the productive land of the city-state. There are indications that the common people (who were also owned by the god, an therefore under the temple’s authority) brought what they grew to the temple, and received back what they needed to live on from the priests. If this is correct, then we have here as near a communist state as we ever get in history. Whatever the true situation (and it probably varied from city to city) the temple acted as a major centre of distribution: receiving, storing and disbursing the food (and other goods, such as seed and agricultural implements) as needed, and keeping back stocks for years of poor harvest or floods. In these circumstances the first bureaucracies in history emerged. Scribes and accountants were needed to keep track of what was being brought into and sent out of the temple store houses. They left behind them thousands and thousands of documents on clay tablets, the majority of them as yet unstudied. The temple would also have employed a large number of menial labourers, as well as skilled craftsmen, and probably even traders who were dispatched to barter with peoples further afield for much needed building materials and other products. In a sense, in fact, the farmers too were temple employees, working the god’s land and under the authority of the temple priests and overseers. By the mid-third millennium, the political dominance of the temple was seriously modified by the rise of kingship in all the Mesopotamian city-states. Exactly how this first came about is unknown, but it seems likely that this development was linked to the endemic warfare that set in between city-states at this time (attested by the appearance of city walls). It may have been that the high priests of the temples – who, in an age when politics and religion were deeply entwined would always have been highly political figures – became more and more important as the people of the city looked to them for military leadership; or it may have been that gifted war-leaders were given (or seized) pre-eminent power in the states. In any event, during the early third millennium BCE kingship arose in all the city-states, and in subsequent centuries became gathered more and more power and status to themselves (judging by the ever-larger palaces that they built). Accompanying this process was the alienation of land away from the temples, with the growth of large estates in the hands of rulers, and later of private individuals. Other aspects of economic life, such as trade and craftwork, followed a similar course. The king was held to be the earthly representative of the patron god of the city. He was a sacred being, and to disobey him was to disobey the god. His primary duty was to ensure that the people served their god properly. Because the people believed themselves to be the slaves of their god, they were also viewed as being slaves of the king. However, the king was also seen as the shepherd of his people, and his duty was not simply to ensure their obedience; it was also to provide justice and order, to protect property, and of course to defend the people from attack. From time to time, one of these city-states would succeed in conquering its neighbours, with the conquering ruler becoming acknowledged by other kings as their overlord, or high king. Extensive states would thus be formed temporarily, enduring for a generation or two. However, holding such conquests together was hard, in the face of invasions from the surrounding mountains or deserts, or from rebellions from within. Mesopotamia would soon fall back into its normal patchwork of small states. Mesopotamian rulers had wide duties. Not only had they to maintain law and order, but they had to ensure that the canals and irrigation systems were in proper working order, so that agriculture could thrive. As a result, much of the bureaucratic apparatus that had grown up to serve the temple was now under the orders of the king, to assist him in fulfilling his awesome responsibilities. The Sumerian city-states had a complex hierarchy of scribes and officials to look after the complex workings of the temple and royal government. Most notably, Ur, at the height of its power under Shulgi (reigned 2094-2047 BCE), had a large and elaborate bureaucracy to administer the remarkably centralized state it had built up. A few centuries later, Hammurrabi, king of Babylon (1792-49 BCE) also had a large organization of officials to assist him rule his empire. By this date, Mesopotamian states also had a regular postal system at their service. To sustain the state apparatus, Mesopotamian landowners had to pay the king a portion of the crops they grew. They also had to provide labour services (“corvee”) to work on the irrigation dykes, channels and canals, and men for the army – theoretically, every male was liable for military service, with only a few exemptions. Also, the king owned large estates from which he could draw income. The individual cities were also responsible for the upkeep of their local irrigation systems, and could raise their own labour for this. To meet their local government needs, the subordinate cities could impose their own taxes and dues, as well as levy duties on local trade. One of the major contributions of ancient Mesopotamia to government practice was the development of written law codes. The most famous of these is the Code of Hammurabi, written about 1780 BCE. However, this code drew on earlier codes going back to the Sumerian city-states of the 3rd millennium BCE. Hammurabi’s code and its predecessors were written on clay tablets or stone pillars, so that they could be seen in public. From them, we know a great deal about the Mesopotamian legal system. Cases were heard by judges appointed by the king; in important cases, a panel of judges was appointed. Appeals could be made to the king. Indeed, it seems that one of the reasons for Hammurabi issuing his Code was to make it clear to all his subjects (who would have been accustomed to different laws in different places) on what basis decisions would be arrived at if appeals were made to the royal court. A person could not be convicted unless there was clear evidence of his or her guilt. However, carelessness or negligence could be harshly punished – famously, the builder of a building which fell down and killed a person could himself be killed (and if it killed a man’s son, then his own son could be killed!). By modern standards, punishments could be harsh – many crimes carried the death penalty (with sentences ranging from hanging to burning). Flogging was used for various crimes, but fines were the most common punishment. As well as criminal law, there was a well-developed body of civil law. Contracts, deeds and agreements had to be written on a clay tablet, witnessed on oath and placed in the temple archives, so that in case of dispute they could be referred to later. Warfare was endemic in early Mesopotamian society, as cities quarrelled over land and water rights. The Sumerian city-states organized the first true armies (as opposed to warrior bands) in history. We know very little about how these armies were composed or organized. Fragmentary evidence suggests that there was a small permanent corps of trained soldiers, which would be supplemented in times of war by a larger group of citizens, called up until they were no longer needed (presumably at the end of the years’ fighting season). Their elite soldiers were armed with bronze armour and weapons, and less-well armed but more mobile troops were deployed slings and bows and arrows. In the 2nd millennium BCE, Mesopotamian armies adopted a new piece of military technology, the horse-drawn chariot. This was an innovation imported from the nomads of the steppes to the north. Mastering chariot warfare demanded considerable training and practice, and the adoption of this technology must have given further impetus to the use of trained, perhaps even professional, soldiers. Mesopotamian religion was polytheistic; more than 2,000 gods and goddesses have been identified. The chief of the gods varied from period to period. For the Sumerians, it was Enlin, the Sky God. The Babylonians worshipped Marduk above all others, and Ashur was the supreme god of the Assyrians. Other notable gods and goddesses were Ishtar, goddess of love and fertility, Tiamat, god of the sea and chaos, and Sin, the moon god. The Mesopotamians conceived of the material world as being deeply bound up with the divine. Every household, village and city had its own god. Everything that happened on Earth had a divine dimension to it – was at least as much the result of the wishes of gods as of men and women. The overriding purpose of man was to serve the gods. This meant not just tending the gods’ sanctuaries and burning incense at their altars, it meant feeding them and providing them with all their material needs. In early Mesopotamian times this meant that the entire economic life of a city-state was geared to the service of the temple. Later, with the rise of kings, the idea grew that, as representatives of the gods on Earth (indeed, in some senses kings were seen as being the patron gods of their cities) they were responsible for the people’s service to the gods. This gave religious justification for their complete authority over their subjects. Mesopotamian cosmology viewed the world as a flat disc, with a canopy of air above, and beyond that, surrounding water above and below. The universe was held to have come out of this water. The Mesopotamians had a rich store of myths and legends. The most famous of these today is the epic of Gilgamesh, due to the fact that it contains a legend of the flood which has various similarities with (but also glaring differences to) the Biblical account of Noah’s Ark. The early Mesopotamian city-state was, to a very large extent, a self-sufficient economic unit. It was viewed as being the household of the patron god – which meant, in practice, that the temple had an immense degree of control over economic activity. Craftsmen – metal-smiths, potters, spinners, weavers, carpenters – and labourers were (what we would call) employees of the temple. So too were traders. Long-distance trade caravans were organized and supplied by the temple, and the traders were temple servants. As time went by this situation was modified by the rising importance of the secular ruler, the king. As he grew in power, little by little he arrogated more economic control to himself. This was achieved through taking land (the primary economic asset) from the temple, and diverting the work of scribes, overseers, craftsmen and workmen to his own purposes. As more time passed, the situation changed again as the king granted lands and wealth to his officials and supporters, and so created a private market for goods and services separate from either king or temple. Traders, craftsmen and labourers increasingly worked on their own account. Nevertheless, throughout ancient Mesopotamian times, temples and palaces retained huge economic influence. The Mesopotamian economy, like all pre-modern economies, was based primarily on agriculture. The Mesopotamians grew a variety of crops, including barley, wheat, onions, turnips, grapes, apples and dates. They kept cattle, sheep and goats; they made beer and wine. Fish were also plentiful in the rivers and canals. The rivers Tigris and Euphrates, and their numerous branches, made farming possible in Mesopotamia. However, they could be wild rivers, and floods were frequent. At the same time, the hot, dry climate meant that year-round irrigation was needed to grow crops. The Mesopotamians were the first people to attempt to control water on a large scale by the use of an integrated system of dykes, reservoirs, canals, drainage channels and aqueducts. Maintaining, repairing and extending this system was seen as one of the prime duties of a king. Scribes and overseers managed the projects, and the common people were dragooned into working on them through the system of forced labour (or corvee). The water control system was built up generation by generation, covering an ever wider area and involving an ever denser network of waterways. As a result of the large and concentrated population which grew up in Mesopotamia, farming was carried out by peasants rather than by slaves (mass slavery tends to be a response to a shortage of labour). In early times these were bound to the land as temple or royal serfs; later, some became free farmers, owning their land outright, but many farmed estates owned by kings, temples, high officials and other wealthy members of the ruling classes. All remained liable to forced labour on irrigation projects, or on the construction and maintenance of temples, palaces and city walls. Until the spread of the use of iron, in the first millennium BCE, farming implements were made of stone and bone – as they had been during the Stone Age. Metals such as bronze were far too expensive to use in this way, while copper was too soft for most uses. Wood was also quite rare, as there is little tree cover in the region. However, the soil of Mesopotamia, once watered, is easy to work, and agriculture was highly productive. The plain of Mesopotamia was created in comparatively recent times (from an geological point of view) by the mud brought down by the rivers. This means that the region is very short of useful minerals such as stone for building, precious metals and timber. This had the effect of stimulating trade with neighbouring regions, and beyond. Early in Mesopotamia’s history food surpluses and craft goods were exchanged for mineral resources. Later, Mesopotamian merchants ventured further afield, with trading contacts being developed with peoples in Syria and Asia Minor in the west, and in Iran and the Indus civilization, in the east. With the coming of the Bronze Age, in about 3000 BCE, an added incentive to trade was the desire to acquire the copper and tin needed to make this valuable metal. Once Mesopotamian states started to equip their soldiers with bronze armour and weapons, this hunger intensified. However, these minerals are only found in widely scattered locations, so the search for them involved developing long distance trade routes. Trade caravans (of donkeys – camels were only domesticated after 1000 BCE) were organized by specialist agents, to whom merchants entrusted their goods. Overland transport was by oxen. Most bulk goods (such as the timbers brought from as far away as Lebanon) was transported by river. Sea-going ships were also used, with trading voyages being made to the ports of northern India. Metal coinage would not come into use until much later, but trade was based on a regulated system of exchange – a given amount of seed would be worth so many ounces of silver, for example. These relative values were enshrined in the law codes. Temples acted as banks, with merchants and landowners acting as lenders. Written drafts (inscribed on clay tablets) were used by merchants to draw “money” from the temple-banks. Temples also made loans on their own account. If the debt was repaid before the due date, no interest was levied. If it was late, a high interest of 20-30% was charged. The ancient Mesopotamians lived in cities, which formed the core of the city-states. These cities were surrounded by numerous satellite villages, and in the case of the larger cities, smaller towns were also under their authority. Estimates for the size of Mesopotamian cities vary wildly. However, a typical city may have housed 20,000 people, and a larger one 50,000. Once it became the chief city of southern Mesopotamia, Babylon could have had a population of as much as 100,000. The typical Mesopotamian city was built around the temple, a monumental structure sitting at the centre of a complex of granaries, storehouses and other administrative buildings. From the mid-second millennium onwards, a monumental royal palace would also stand nearby, sometimes rivalling the temple in magnificence. One or more wide streets connected the central area to the city gates. Away from these public spaces, the large homes of the elite and the squat mud dwellings of the common people crowded together, interspersed by narrow passages down which even pack animals could not pass. The stench must have been appalling, as most people had no means of disposing of their waste apart from into the street. No wonder the better-off houses had all their windows facing inwards, onto their courtyards! The larger cities followed the above pattern except that they were composed of several districts, each one centred on its own temple (whose god was subordinate to the patron god of the city). The city proper would be enclosed by a stout mud or baked brick wall, pierced by guarded gates. Just outside these gates were probably reed huts of those unable to afford to live inside the walls. The remains of such structures have long since perished, but carvings depict them, and many people in modern Iraq live in similar houses. Either joined to the main town, or a little distance from it, were the quays of the river or sea port. Around the harbour were the homes of foreign traders, who would not have been allowed to live in the city itself. The city’s market would probably have been held here. Surrounding this built up area was the territory ruled from the city. Nearest the city were the irrigated farms and meadows. Dense villages of closely-packed mud huts dotted this countryside, and every now and then the large courtyard-style house of a wealthy landowner. Beyond the fertile farmland would be the grassland where shepherds and nomads grazed their sheep and goat; and beyond this, the desert. Most of the population in ancient Mesopotamia were farmers, working small plots of land. Above them stood a very small elite group made up of the ruling classes – kings, courtiers, officials, priests and soldiers. Merchants and craftsmen also held a high position in society. The elite was greatly restricted in size by the difficulty, length of time and expense it took to acquire literacy and numeracy. The cuneiform script had hundreds of symbols to master, which took long years of hard schooling – and one can be sure that access to such schooling was available only to the children of elite families. In any case, the vast majority of ordinary folk needed their children to be contributing to the family income as soon as they were able, and not spending time in education. All this would have given the members of the literati a huge amount of authority over the rest of the population. Only through exercising the skills of literacy and numeracy could the large bodies of people be organized. Very probably literacy was seen as a mysterious and sacred skill, conferring high status on those who possessed it. In early Mesopotamia, members of this elite group would have been supported by temple revenues. later, as temples lost their pre-eminent place in Mesopotamian society, a career in royal service would have become a more important source of income for ambitious officials. Later still, as kings gave away landed estates, or as wealthy individuals were able to purchase them, the topmost levels of Mesopotamian society would have come to form an hereditary landed aristocracy. Near the bottom of society was an underclass of landless labourers and beggars. These had only restricted rights as citizens; and right at the bottom was a class of slaves, who had very few rights. They could be bought and sold like other property. They had either been war captives, or had fallen into slavery through debt, or had been born into slavery. They worked as household servants, as workers in workshops, and in other menial roles. However, they could acquire property, and even own other slaves. They also had the right to buy their freedom, if they were able. Most marriages were monogamous, though concubines were farily frequent, especially in wealthy families, and more especially where the wife was unable to have children. Women had a respected place in Mesopotamian society, at least by the time of Hammurabi’s Code. They had rights and duties as citizens, they could act as witnesses in court, and they could own property. She brought a dowry into the family, and although divorce was entirely a husband’s prerogative, the divorced wife would take her dowry with her out of the marriage. A widow took the husband’s place at the head of the household until her children were adults. She was not able to sell any of the family’s property, however; this was so that the children could inherit their full share from their father’s wealth. Should she remarry, the children still retained their full rights to their father’s inheritance. A father had complete control over his children’s lives, even to the point of selling them into slavery, until they married. A father could will his inheritance to any of his children, but generally daughters received an equal share with their brothers. Numerous technological advances can be attributed to the Mesopotamians: irrigation, the plough, the sail, clay bricks, the potters wheel, metal-working (including metal armour and weaponry), writing, accounting, filing, glass and lamp making, weaving and much more.They also developed an impressive body of scientific knowledge through close observation of the natural world. Exhaustive lists of animals, plants and minerals have come down to us, as well as lists of Geographical features – rivers, mountains, cities and peoples. Plans of cities have been discovered, the most complete one being of Nippur, which matches the maps made by archaeologists. The Mesopotamians also showed a practical grasp of chemical processes in many fields, for example in the preparation of recipes and pigments, and the manufacture of coloured glass. Mesopotamian science was particularly fruitful in three areas, mathematics, astronomy and medicine. The Mesopotamians developed mathematics to a more advanced level than any contemporary people, and in so doing laid many of the foundations for modern mathematics. Mesopotamian scribes produced detailed mathematical tables, as well as texts posing advanced mathematical problems. From these we know that they developed a number system based on base 60, which has given us the 60-minute hour, the 24-hour day, and the 360-degree circle. The Sumerian calendar was based on the seven-day week. Their number system, alone in the ancient world, had a place-marker to denote values, as in modern mathematics (as in 3,333 when the number 3 represents 3,000, 300, 30 and 3 respectively). They developed theorems on how to measure the area of several shapes and solids, and came close to an accurate measure of the circumference of circles. They fully understood square roots and cube roots. This knowledge was not just theoretical. It was applied to the design and construction of large buildings, long aqueducts and other ambitious engineering projects. A major branch of Mesopotamian science was astronomy. Mesopotamian priests produced astronomical tables, and could predict eclipses and solstices. They worked out a 12-month calendar based on the cycles of the moon. Mesopotamian astronomical knowledge was later to have a major influence on Greek astronomy. As with most pre-modern cultures, astronomy and astrology were inextricably bound together: the movement of the heavenly bodies were seen as having a direct influence on the affairs of men. This was a powerful stimulus for priests to work out as exactly as they could the movement of the planets and stars. As in all ancient societies, medicine and religion went hand in hand. Disease was seen as a sign of the gods’ displeasure with a person, or even as a manifestation of evil spirits indwelling them. The duty of the doctor was to identify the sin which had caused such displeasure, and to prescribe the correct religious ceremony to bring about healing. Exorcism commonly recommended. It is clear, however, that many Mesopotamian doctors mingled this approach with a more practical study of the human body and its maladies. Many tablets, for example a text called the Diagnostic Handbook, dated to 11th century BCE Babylon, list symptoms and prognoses. These show that Mesopotamian doctors had developed rational techniques of diagnosis, prognosis, physical examination, and prescriptions alongside the more mystical elements of their trade. Diagnosis and prognosis were based on rules of empirical observation and logical reasoning (as in modern medicine). Doctors used bandages, creams and pills in their treatments. This involved a sound understanding of the properties of different herbs and minerals. A large amount of ancient Mesopotamian literature has come down to us, much of it found in royal libraries dating from Assyria and late Babylonian times. The literature is written in cuneiform script, and contains prayers, hymns, myths, epic poetry, collections of proverbs, works on theology, philosophy, politics and astrology, books of spells, historical records and many other kinds of texts. The best-known piece of Mesopotamian literature is the Gilgamesh Epic, which, in the form it has come down to us, dates to around 2000 BCE; this long poem is famous for pre-dating the Biblical story of Noah’s Ark by telling of a world-wide flood. The main forms of Mesopotamian art which have come down to us are sculptured figures in stone and clay. Few paintings have survived, though most sculpture was also painted. Mesopotamian sculpture comes in all sizes, and appears in the round and as reliefs. It often depicts animals, such as goats, rams, bulls and lions, as well as mythical creatures such as lions and bulls with men’s heads. Others show gods and goddesses, as well as priests and worshippers. Most human figures from the early period have large, staring eyes, and, on men, long beards. As time goes by the figures become increasingly realistic. Under the Assyrian and Babylonian empires, sculpture takes on a colossal form, with giant statues guarding the royal palaces. On a smaller scale, cylinder seals come from all periods of Mesopotamian history. many are beautifully executed, with highly complex and sophisticated designs. Temples: Mesopotamian temples were designed to a rectangular plan. Early examples were constructed atop a small earthen platform; as time went by, these platforms became taller and taller, giving rise to the classic Mesopotamian ziggurat. Ziggurats probably represented the sacred mountain where gods and men could meet. They were brick-built temple-mounds, taking the form of a layered platform. They resembled step pyramids with a flat roof, on which a shrine would be built. Access to this shrine was by a broad staircase or ramp. Constructing these great buildings demanded high level design and engineering skills. Their exact proportions show that their builders had a complete mastery of the mathematics involved. Surrounding the central temple building was a complex of ceremonial courtyards, shrines, burial chambers for the priests and priestesses, ceremonial banqueting halls, along with workshops, granaries, storehouse and administrative buildings, as temples were main centres of economic and administrative activity in ancient Mesopotamia. Palaces: The palaces of Mesopotamian rulers were large and lavishly decorated. Built around a series of courtyards, these complexes housed craftsmen’s workshops, servants quarters, food storehouses, shrines, and of course the domestic accomodation for the royal family. The largest of these led off to the throne room, of a size and majesty designed to stun visitors. The palace walls were decorated with carved stone slabs on which pictorial and textual depictions of cultural scenes or the the Kings’ deeds. Gates and important passageways were flanked with massive stone sculptures of mythological figures. Outside, these palaces were often adjoined to expansive gardens and parks, stocked with wild animals for hunting. Houses: The materials used to build a Mesopotamian house were the same as those used today: sun-baked brick made of mud mixed with straw, mud plaster and wooden doors. These all used materials naturally available in the locality. Most large houses, whether in town or country, were built around a courtyard. Off one side was a large square room, where the family received guests and ate together. Leading off this room were the private family quarters. Other sides of the courtyard led to the kitchen, store rooms and servants accommodation. The homes of the poor were probably built of materials such as mud and reeds, which have long since perished. They may have been situated in the ancient equivalent of shanty towns outside of the city walls, but there is very little archaeological evidence for this. All subsequent Western civilizations were ultimately built largely upon foundations laid here. Mesopotamian civilization deeply influenced societies in Syria, Palestine and Egypt. These in turn, especially via the Phoenicians and the Israelites, would provide the material, religious and cultural models on which the Greek, Roman and Islamic civilizations would later be constructed. A whole range of technologies and scientific advances were thus made in ancient Mesopotamia which eventually found their way to Medieval and Modern European civilization. To the east, powerful Mesopotamian influences flowed into India at the time of the Assyrians and Persians – for example, the Sanskrit alphabet is based on the Aramean script. So, the Mesopotamians built long and well; they were the giants upon whose shoulders later ages have stood. And given that they were the first people to have writing, and the first to record their deeds, their place in world history is, it is no exaggeration to say, as the ones who got it going!